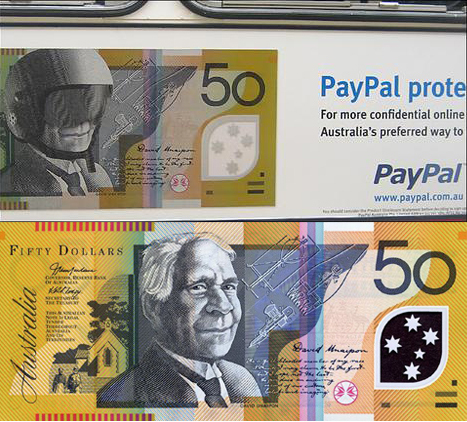 Apparently at least some Australians aren’t happy with a PayPal advertisements that include legendary Aborigine David Unaipon with a motorcycle police helmet added on to suggest PayPal has heightened security. The ads, which are on the sides of buses in Australia, says the Sydney Morning Herald, are disrespectful and degrading according to Unaipon’s relatives. The ads also apparently feature other bills as well. And PayPal, instead of just not commenting or removing those specific ads, makes a mess of it. “PayPal spokeswoman Kelly Stevens said the ads were “perfectly legal”” – which doesn’t really address the issue. It’s not clear that many other Aborigines are offended. And the two Unaipon relatives seem to be in the process of shaking down the government for permission to use Unaipon’s portrait on Australian currency at all. Maybe they’re just looking for a little something from PayPal, too. Sometimes I feel bad for PayPal and all the negative publicity they get. Then I remember how terrible their customer service is, and how many times I’ve been angry at them, and I feel a lot less bad.